For a new medical device to make it from “bench to bedside,” it needs guidance from not just an engineer but someone in the medical field who knows how it will actually work in the clinical setting with patients. That’s where someone like Graham Ives comes in. Graham has been interacting with patients since he was a kid helping around the office at his mom’s medical practice. 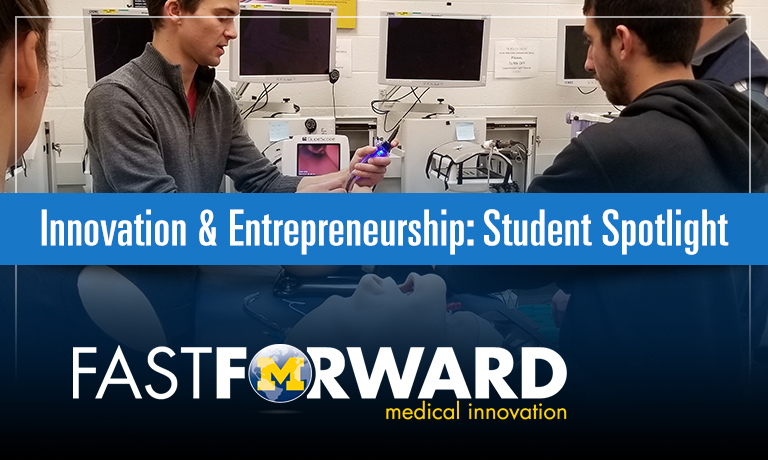 Now a fourth-year medical student at the University of Michigan with a passion for teaching, Graham saw medical innovation and device development as a way to improve surgical outcomes and expand treatment options for patients. And when Fast Forward Medical Innovation’s fastPACE program came up in spring 2017, he jumped on the opportunity to learn more about innovation development and customer discovery. Now, as an Path of Excellence (PoE) Innovation and Entrepreneurship student, Graham is continuing his journey in the world of innovation in biomedical research and medicine. Graham’s interest in the medical field started at an early age. His mother is a primary care doctor and he worked in her office growing up, doing back office work and staffing the front desk, which gave him a chance to meet the patients. That’s when he really could see himself in the profession, he said. With a desire to fix things, Graham started his undergraduate degree in electrical engineering, but later pivoted to molecular biology. After completing his degree at University of Colorado at Boulder, he made the move east to the University of Michigan for medical school. And while he has stayed busy with his studies, Graham has helped make an impact through leadership and teaching. Not only has he worked at The Princeton Review as an MCAT biology instructor, but he was also a teaching fellow at the SCRUBS Surgery Interest Group, and a co-president of Students Teaching AIDS to Students (STATS). Before coming to U-M Medical School, he spent a lot of time at CU Boulder volunteering with advocacy organizations for survivors of sexual assault and other marginalized groups, which “helped develop a particular passion for working with and advocating for vulnerable patient populations,” he said in his personal statement. 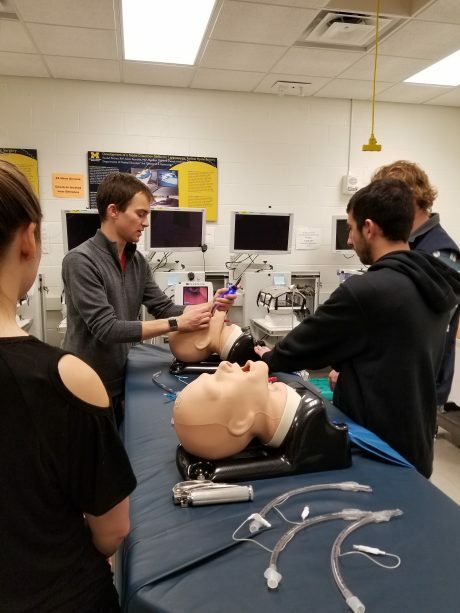 While in Michigan, Graham has volunteered as an admissions ambassador for the U-M Medical School and as a MedBuddy at MedStart where he paired up with pediatric inpatients at the C.S. Mott Children’s Hospital. Currently, he volunteers at the U-M Student-Run Free Clinic in Livingston County. Now in his fourth year, his main focus is getting a residency and becoming a doctor. He is looking at strong plastic surgery programs with an innovation component to build on his knowledge and continue work on expanding patient treatments. This also includes teaching and helping vulnerable populations.